livingsilver94 updated the test plan for D5642: Update rust to 1.34.0 and extract cargo package. livingsilver94 added a parent revision for D6061: Update librsvg to 2.45.5: D5642: Update rust to 1.34.0 and extract cargo package. livingsilver94 added a child revision for D5642: Update rust to 1.34.0 and extract cargo package: D6061: Update librsvg to 2.45.5.
livingsilver94 updated the summary of D6061: Update librsvg to 2.45.5.
livingsilver94 requested review of D6061: Update librsvg to 2.45.5.
livingsilver94 updated the summary of D5642: Update rust to 1.34.0 and extract cargo package. livingsilver94 updated the diff for D5642: Update rust to 1.34.0 and extract cargo package. livingsilver94 awarded R3148:00e8b26367e2: Switch to using a scalable icon from Papirus. a Like token. Herald added a project to T7876: Sound volume randomly resets to 12% after a reboot: Lacks Project. livingsilver94 added a comment to D6036: Initial commit of netcdf. Regarding your test plan: units test are cool, but they shouldn't be the whole test plan. Just manually perform some operations with your package or try to build Generic Mapping Tools against netcdf-c and make sure it works. And finally, patch's title should match the package name, so in in this case it misses -c.
Apart from the many errors in package.yml, and your insufficient test plan, there has been no package request for netcdf yet. Why did you push this? livingsilver94 added a comment to D5993: Update keepassxc to 2.4.1.
livingsilver94 requested review of D5987: Update keepassx to 2.4.1.
livingsilver94 updated the summary of D5975: Update mame to 0.208.
livingsilver94 updated the diff for D5975: Update mame to 0.208.
livingsilver94 updated the diff for D5936: Update rmlint to 2.8.0.
livingsilver94 requested review of D5975: Update mame to 0.208.
livingsilver94 updated the summary of D5936: Update rmlint to 2.8.0.
livingsilver94 updated subscribers of D5936: Update rmlint to 2.8.0. WARNING: @JoshStrobl Shredder (the builtin GUI) looks for GtkSource 3.0, which I think we don't have. livingsilver94 requested review of D5936: Update rmlint to 2.8.0.
livingsilver94 added a comment to D5642: Update rust to 1.34.0 and extract cargo package. I can't test Firefox because of a known issue. I'm a noob at reading bug reports and patching, plus I'm currently ill. Any help is welcome, otherwise just be patient. livingsilver94 updated the summary of D5864: Update openfortivpn to 1.9.0.
livingsilver94 requested review of D5864: Update openfortivpn to 1.9.0. Firefox 68 got the fix, Firefox 67 patch is still pending. livingsilver94 added a comment to T7743: Darktable 2.6.2 2.6.1 & 2.6.0. Just an early notification : the fix already exist but as you discovered it, only in the master branch and not in the released 2.6 branch. They will schedule the update for the already existing fix found into master branch. We'll have to wait for 2.6.3 or 2.6.4... Thank you very much for your time already passed on this problem. I'm not sure what their reply means as in version 2.6.2 the library is still called picasa.c. It's true though, that in the master branch they renamed it to googlephoto.c. livingsilver94 added a comment to D5798: Update keepassx to 2.4.0. So is my patch no longer necessary? Are the yubikey tests still there? livingsilver94 updated the test plan for D5798: Update keepassx to 2.4.0.
livingsilver94 updated the summary of D5798: Update keepassx to 2.4.0.
livingsilver94 updated the diff for D5798: Update keepassx to 2.4.0. I could also patch it to entirely disable update checking, but that would result in a fairly big patch to maintain. livingsilver94 added a task to D5798: Update keepassx to 2.4.0: T7717: Update KeepassXC to 2.4.0.
livingsilver94 added a revision to T7717: Update KeepassXC to 2.4.0: D5798: Update keepassx to 2.4.0.
livingsilver94 requested review of D5798: Update keepassx to 2.4.0.
livingsilver94 added a comment to T7717: Update KeepassXC to 2.4.0. @kyrios123 There's no button to claim it :-/ I don't know why. It's on my radar! I'd like to claim the task. livingsilver94 added a comment to T7715: Nextcloud missing dep. Not yet. There was a power outage in my area until a hour ago. 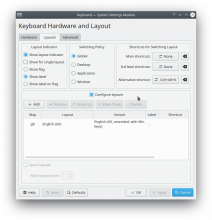 livingsilver94 added a comment to T7671: Suggestions for better Plasma defaults. livingsilver94 updated the diff for D5650: Update antibody to 4.1.1.
livingsilver94 added inline comments to D5650: Update antibody to 4.1.1.
livingsilver94 requested review of D5650: Update antibody to 4.1.1.
livingsilver94 updated the task description for T7671: Suggestions for better Plasma defaults. livingsilver94 added a comment to T7675: Package removal fails for boostnote . Does sudo eopkg rebuild-db work? livingsilver94 updated the diff for D5645: Disable update checking. livingsilver94 requested review of D5645: Disable update checking. Am I missing something? Of course I could specify them manually, but that's not how it usually works when the libs *are* in abi_used_libs. livingsilver94 updated the diff for D5639: Update xorg-driver-video-amdgpu to 19.0.0. About the rest, sure I will take care of it later! livingsilver94 retitled D5642: Update rust to 1.34.0 and extract cargo package from Update rust to 1.33.0 to Update rust to 1.33.0 and extract cargo package. livingsilver94 requested review of D5642: Update rust to 1.34.0 and extract cargo package. livingsilver94 created T7671: Suggestions for better Plasma defaults. livingsilver94 added inline comments to D5639: Update xorg-driver-video-amdgpu to 19.0.0.
livingsilver94 requested review of D5639: Update xorg-driver-video-amdgpu to 19.0.0.
livingsilver94 added a comment to T6583: Wrong keyboard layout in sddm if user is not logged in . This is the clearly wrong setting you cansee right after the installation. This is the correct one, manually set. 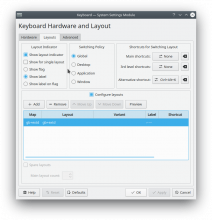 livingsilver94 reopened T6583: Wrong keyboard layout in sddm if user is not logged in as "Open". I expect the layouts screen to lack layouts until you add more (the correct layout tends to autofill). livingsilver94 updated the diff for D5612: Initial commit of libkmahjongg. livingsilver94 updated the diff for D5613: Initial commit of kmahjongg. livingsilver94 added inline comments to D5613: Initial commit of kmahjongg. 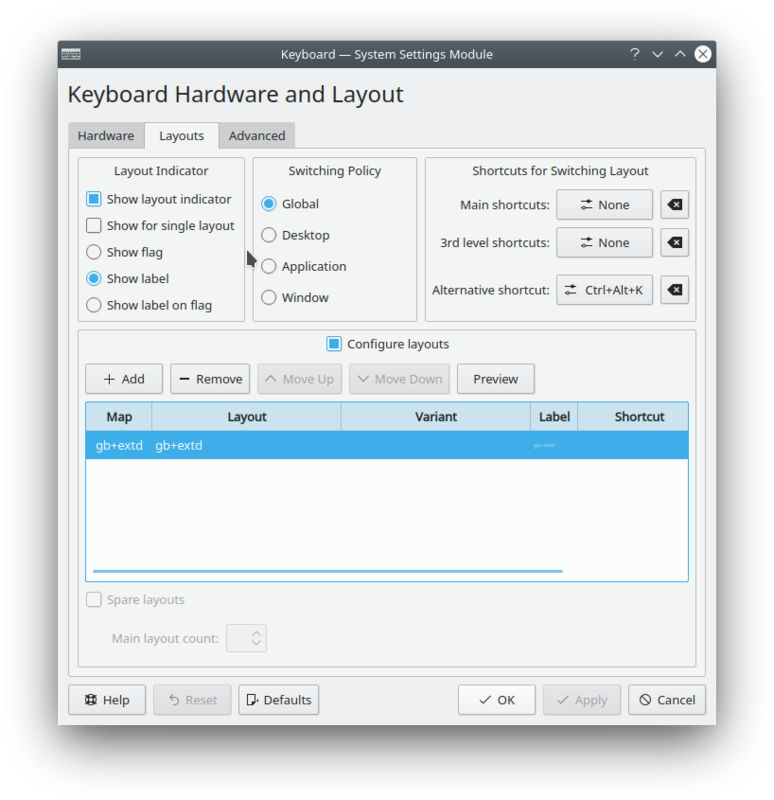 livingsilver94 added a task to D5613: Initial commit of kmahjongg: T7590: KMahjongg. 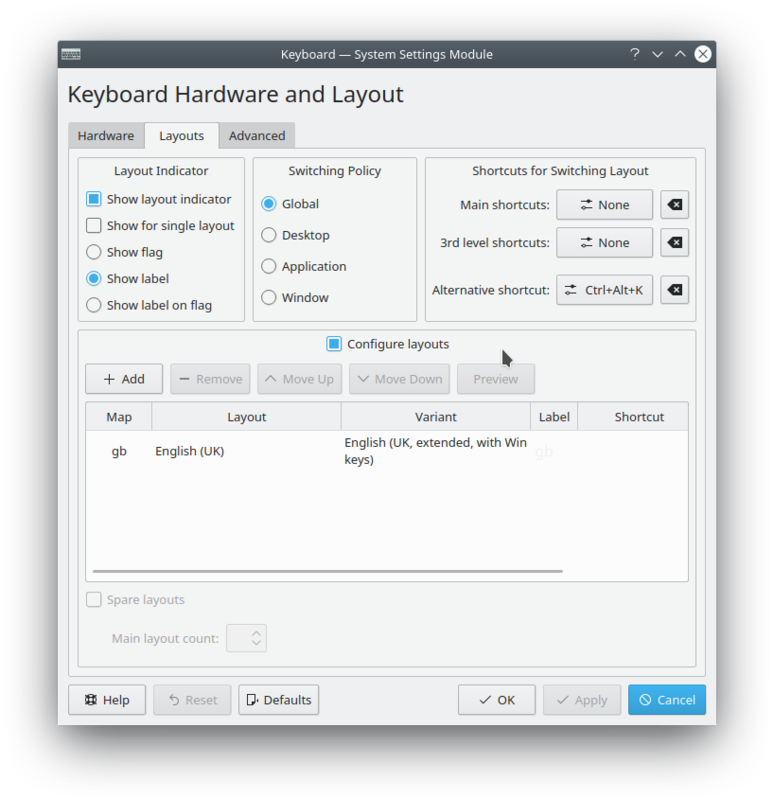 livingsilver94 added a revision to T7590: KMahjongg: D5613: Initial commit of kmahjongg. livingsilver94 added a parent revision for D5613: Initial commit of kmahjongg: D5612: Initial commit of libkmahjongg. livingsilver94 added a child revision for D5612: Initial commit of libkmahjongg: D5613: Initial commit of kmahjongg. livingsilver94 requested review of D5613: Initial commit of kmahjongg. livingsilver94 requested review of D5612: Initial commit of libkmahjongg. livingsilver94 added inline comments to D5600: Inclusion of radeon-profile resolves T7648. livingsilver94 updated the task description for T7651: "extract" Cargo package from rust package. Herald added a project to T7651: "extract" Cargo package from rust package: Lacks Project. livingsilver94 requested review of D5582: Update mame to 0.207.
livingsilver94 added a comment to T5874: JOSM. @JoshStrobl @DataDrake pinging you again. Would my previous solution be acceptable? Or, alternatively, we can create local tarballs like we do for Firefox langpacks. livingsilver94 added a comment to D5571: Update fish to 3.0.2. Nah. For example, fish --version returns unknown (or something like that) if built from the Github-generated tarball. livingsilver94 added a comment to T7644: ModuleNotFoundError: No module named 'apparmor'. Sorry, I couldn't find the original bug report with my initial keywords. livingsilver94 merged T7644: ModuleNotFoundError: No module named 'apparmor' into T4287: AppArmor Python tools/libraries are broken. livingsilver94 merged task T7644: ModuleNotFoundError: No module named 'apparmor' into T4287: AppArmor Python tools/libraries are broken. Herald added a project to T7644: ModuleNotFoundError: No module named 'apparmor': Lacks Project. livingsilver94 updated the diff for D5529: Update git to 2.21.
livingsilver94 added a comment to D5529: Update git to 2.21. I know, Josh, but the line was lastly edited in September, many things could have changed since then. Can we try again with all tests enabled? If they fail, I'll just revert the lines. livingsilver94 awarded R1982:8530531f6d60: Do another thing. a Party Time token. livingsilver94 added inline comments to D5529: Update git to 2.21.
livingsilver94 requested review of D5529: Update git to 2.21.
livingsilver94 added a comment to T7610: mycroft-core missing rundeps. EDIT for clarification: OK we're not missing packages here, but still my statement is valid. livingsilver94 updated the summary of D5372: Update flacon to 5.1.0.